Cancer. 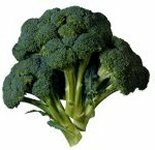 Broccoli is high in beta-carotene, a powerful antioxidant, and is associated with a reduced risk of lung cancer. Broccoli is high in Vitamin K which may also lessen the risk of cancer. Estrogen. High estrogen levels can lead to cancer in both men and women. For women going through menopause, estrogen is responsible for many of the difficult symptoms. It also increases a woman's risk for cancer. Broccoli is high in a compond called Calcium D-glucarate which may indirectly reduce the risk of breast cancer by reducing the body's stress from estrogen. Another estrogen mediating compoung is 13C, shown to be effective in both men and women at mediating estrogen and lowering the risk of cancer. Asthma. Broccoli contains a good share of the antioxidant Vitamin C which is also anti-inflammatory. Research indicates that individuals who eat a diet high in fruits and vegetables rich in Vitamin C experience asthma symptoms less often. Bruising. Again, the Vitamin C in broccoli can reduce bruising in those who tend to bruise easily. Liver Detoxification. Broccoli contains sulforphane which has been shown to be a potent inducer of enzyme secretion during stage II liver detoxification. This substance may also have anti-cancer effects. Cataracts. The beta-carotenes or Vitatmin A found in broccoli appear to lessen one's chance of developing cataract formation. Fiber. All cruciferous vegetables are high in insoluble fiber which helps you stay regular and protects from colon cancer. Broccoli and other cruciferous vegetables make great weight loss foods. They have healthy fiber to keep you full and help regulate insulin levels. One cup of fresh broccoli has 2.6 grams fiber and only 25 calories. Most of the calories are used up during digestion so you really don't have to count the calories at all. To get the most nutrition out of broccoli and other cruciferous vegetables they should be eaten raw or steamed. Cooking robs them of many phytonutrients and much of the fiber. Broccoli is one of nature's all time great foods. It reduces the risk of several cancers, decreases inflammation, has powerful antioxidant capabilities, helps to level unhealthy hormones and is full of fiber. Make sure broccoli is on your next shopping list for better health.